This isn't my very first manga, but it's the first one that caught my attention after years of reading American comics. My first impression: Is that David Bowie? What is that squiggly feeling inside me? No. It is not David Bowie. It is Earl Dorian Red Gloria, an openly gay English art thief, and I think I am in love. And that other guy, that is Klaus. He is German and totally full of angst. He likes rules and despises the Earl, except that he secretly is totally as in heart with him as I am. I love the silliness of this manga, and its beautiful 1970's aesthetic. There is something very glam and very girly and very jack boot rock 'n' roll going on here. 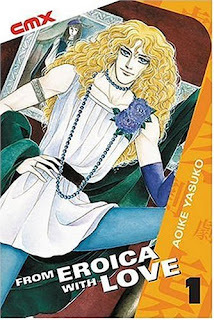 From Eroica with Love was my gateway manga. It was odd enough to pull me out of my indie American and superhero comics malaise and show me there was something new in the world. Oddly, I've only read three issues of this manga, even though it just goes on forever and ever. I'd be interested to know if any of our dear readers have picked this up and what their impressions are? Eroica is so absolutely 70s! It couldn't be more 70s if it was covered with shag carpet.